Ever wonder what it’s like to live through a military lockdown? Well, that’s precisely what happened to Anne Krapu while living in Beijing. Anne joins Joe to share what happened as well as some of her more fonder experiences traveling the globe. Update from January 29, 2018: This post has been updated with a re-release of Anne’s appearance on Without A Path two years ago. Last week I received a message from Anne’s brother letting me know that she passed away unexpectedly. After hearing this news, I re-listened to our conversation and felt compelled to share it again. As her obituary says, Anne truly lived her life to the fullest and she clearly left her mark whether it was for the various political causes she championed or traveling the world and sharing her experiences with people like me. If you’d like to learn more about Anne, and I suggest you do, you can read her obituary here. I’ll warn you in advance that it’s heartbreaking, but perhaps it’ll inspire you to be a better person — a person like Anne Krapu. Few words can properly articulate my excitement when I was invited to visit Japan and tour the Okayama and Kagawa prefectures. Who doesn’t want to go to Japan? We all have a romanticized image of the Japanese countryside in our mind, clashing beautifully with modernization churning full speed ahead along the rails of their bullet trains. I arrived to Okayama in late November, thrilled not only to be in Japan but also to be starting in two regions I had previously never heard of. My first thought was on the infrastructure. The narrow roads, signs, and rails struck me as very European compared to other Asian countries I had traveled. The most obvious difference being the postcard Japanese architecture apparent in nearly every building — home, shop or office — that wasn’t a high-rise. Touring with three U.S.-based travel agents and our Japanese hosts, we began in Okayama Castle and its surrounding park grounds. What better place to start? I said to myself as that quintessential Japanese architecture in Okayama Castle peered over us. The castle’s history stretches back to the 16th Century, nicknamed the Crow Castle for its black exterior. U.S. forces destroyed the original incarnation during World War II, but it has since been replicated to such a meticulous degree that an amateur eye could hardly tell the difference. “Japan, Japan, Japan!” I giddily chanted to myself as we toured the rolling hills and bridges surrounding the castle. Everything felt distinctly Japanese, at least as I had imagined it. My first surprise came when noticing a group of cameras at the top of some stone steps. “Wonder if something is going on,” I said to one of my colleagues. Then, as we passed them, a funny thing happened. They started to follow us. Apparently, we were the event. It was local Japanese media covering the travelers visiting this lesser-traveled corner of Japan, curious as to our impressions. That night, somewhere out there on the Japanese airwaves, I made a blip on the news radar as I stumbled through limited, unintelligible Japanese to offer my graciousness for an unexpected reception and my enjoyment thus far in the country. Of course these cameras followed us as we were offered the opportunity to try on traditional samurai attire. I hope it made whoever edited that piece in the newsroom laugh, seeing the likes of my very not-Japanese self-shuffle out in a bald cap and wooden sword. The cameras did, however, wait outside as we were ushered into a small, wooden building that looked like it could’ve been centuries old. I marveled at the interior design typical of Japanese buildings, namely the comfort of those tatami mats against my feet. Somehow in my romanticized of Japan, I had forgotten about these traditional accouterments inside buildings. The four of us sat over red carpet as green tea was served to us in an official Japanese tea ceremony. Zen Buddhism was an early influence of the ceremony in which drinking is turned into an art form involving slight twists and turns of the cup. If nothing else, drinking (and later eating) in the Japanese style taught me to slow down and enjoy the moment as opposed to my typical ravenous style. Speaking of food, it was time for my first meal at nearby Arate Saryo. I had a difficult time keeping up with the names of everything we were eating, but suffice it to say Japanese cuisine more than lived up to its hype. The evening ended with a stroll through Kurashiki. As trite as it is to say, it did strike me as having appeared out of nowhere. Moments before we were moving along relatively drab city streets that appeared to have sacrificed character for getting modern buildings up. Then, we were at the entrance of Kurashiki’s main thoroughfare. And to my great joy, it was pedestrians only. Shops and the Ohara Museum of Art lined the main street with a calm stream splitting the town in half. A small canoe full of paddlers made its way downstream with the quiet murmur of Japanese tourists and locals taking in their surroundings. The stress of overseas travel and time zone changes immediately left my shoulders with the absence of vehicles filled with pedestrians and the occasional cyclist rolling by. 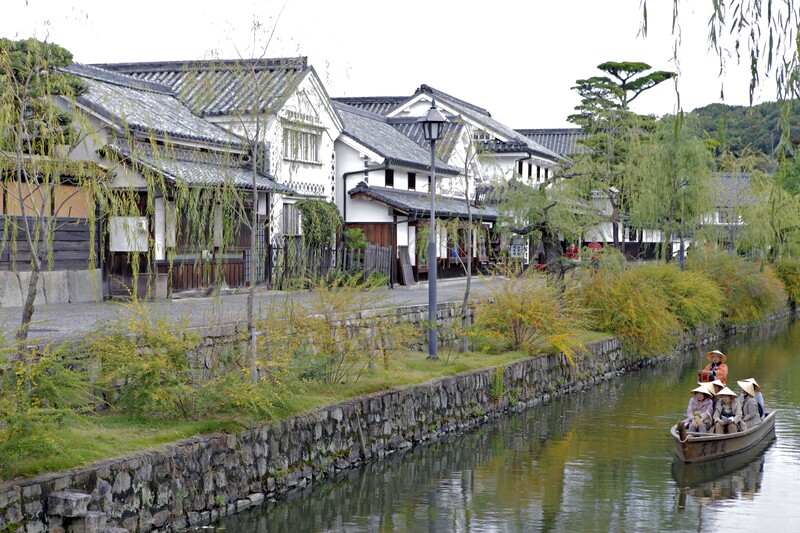 Best of all was staying right in the heart of town at Ryokan Kurashiki, a traditional Japanese inn. My feet were thrilled to return to the tatami mats, something I decided I could get used to. There was also a pleasant smell to the traditional inn. Is it the wood? I wondered. That night the whole of our group threw on some yukatas for dinner. I was admittedly behind on that memo, first appearing in casual clothing. A member of the staff followed me to the room to show me how to properly dress myself. “Fold left over right. It’s very important,” she told me. Right over left is what they do for the deceased, so I was happy to oblige. What better way to start your day than by forging some swords? That’s precisely what we did as we headed out to the Bizen Osafune Japanese Sword Museum. The tour was all well and good, but I was eager to get whacking. We watched the blacksmiths, dressed in what I presumed was traditional attire, strategically hammer away at the scolding hot metal as commands were yelled. After watching a few examples, we were guided back outside to take some practice swings on a log — probably a good idea. A new crew of local media watched as we each took our turn. Heading back in, I happily volunteered to go first. I whacked away, fighting off images in my head that I would somehow smash my own finger or set something on fire. Instead of burning the place to the ground, I managed to garner a few laughs at my expense when I missed the sword completely. It was a very dull sound, smacking the hammer straight against the ground as if I did it on purpose. That aside, I thought I faired just fine for my first attempt at Japanese sword making. Our workout out of the way, we then made way for the Shizutani school. It was easy to see how it got its name, shizutani meaning “quiet and peaceful valley” in Japanese. Like Okayama Castle, this visit sufficed for a relaxing walk among beautiful surroundings. Here our host noted that the leaves would usually be dying this time of year, but instead, we were being treated to a late turning of color. One Mr. Ikeda Mitsumasa created the Shizutani school as a school for commoners in the late 17th Century. Inside the open lecture hall, we were treated to an explanation of the schooling system and how the class would run. Though we had brought mats with us for our knees, I was still squirming in pain as I attempted to keep the traditional kneeling position throughout our lesson. Alas, one by one, we all retreated to a seated position as our host read Confucious without a hint of discomfort. Our journey through southern mainland Japan concluded with a ferry ride over to Shikoku Island’s Kotohira. Like Kurashiki before, this was another pedestrian favorite. Sure, cars could come through, but it was designed in such a way that only the most entitled of motorists would dare force their way through. Anyone who did was met with harsh glares. “This is where the Japanese people come for a weekend vacation,” our host shared. And it showed. Beyond our group, there didn’t appear to be a foreigner in sight. Instead, it was the Japanese themselves clicking their cameras and peeking into the shops. After a quick taste at the local brewery, we made our way up to the Kotohira Shinto Shrine on nearby Mount Zozu. True pilgrims make their way up over the approximately 1,400 steps, but with rain and harsh winds, we settled for a shuttle. Being admittedly rather ignorant of Shintoism, I instead took the time to enjoy the surroundings and traditional architecture that seemed even more abundant than usual. But at such heights, the wind indeed proved rather brutal and we returned to town. Now there’s certainly a number of things one can do in Kotohira, but you’d be a fool to skip out on an udon noodle cooking lesson at the Nakano Udon School. The lesson was all well and good, but it’s made worthwhile by its energetic host and chef who patiently guided us amateurs through what must be a simple process for her. When it came to pounding the dough by foot (fear not, there was a bag separating our feet from the actual dough), she blasted everything from Ritchie Valens’ classic “La Bamba” to Bruno Mars. “Yeah, yeah, yeah!” she screamed, bouncing her hips from side-to-side. She was the cool grandma everyone wants. Stuffed by noodle, it was time to end our jaunt through southern Japan. In just a few days, I had been treated to history, noodles, and swords. What more could one possibly ask for? Disclaimer: I traveled as a guest of Visit Japan. As always, all opinions remain my own. Ric Gazarian of Global Gaz has traveled to 92 countries across the globe. Most recently he’s taken on filmmaking with the adventure documetnary Hit The Road India that will soon be followed by Hit The Road Cambodia. Joining the first episode of Without A Path for 2016, Ric shares his experiences filming in India, Cambodia, and even a dash of Yemen. Joe Note: Long intro today. If you’d like to skip ahead to the conversation with Ric Gazarian, slide up to the 10:18 mark.